The Always Connected PC shows a lot of promise. But as a product class, they've still got a ways to go. I’m fascinated with the Always Connected PC concept largely because it tries to meet the need that the iPad initially identified, and Apple has largely failed to address. Microsoft has been hovering around this idea for some time, with Windows RT being the first failed attempt, crippled by a unique version of Windows that just ran Office and a few other things reasonably well. Then they brought out Continuum, a fascinating modular concept with the Windows Phone at its heart. But sadly, the Windows Phone was failing in market and Microsoft and its partners couldn’t get to a viable offering in time to save their phone. Their latest effort, the Always Connected PC, shows a lot of promise. I’ve been using the Asus laptop form of this for several weeks now, and the combination of instant on, instant connection without needing a Wi-Fi access point, and very light weight has made it one of my favorite laptops. But it’s still a laptop, and the promise that Apple identified was more of a Super Tablet. Well, last week I got my hands on a Lenovo Miix 630, which is physically far closer to the iPad Pro in configuration. More like the original Surface (though both thinner and lighter) with a removable keyboard. This is a big step closer to the ideal, but we are still dealing with a core problem for the class. Screen size – Tablets are best when they’re under 10”…the smaller the better. Laptops seldom sell well under 13”…the bigger the better. Battery life – Tablets are closer to 10 hours. Laptops closer to five. Weight – Tablets are typically less than two pounds. Laptops are typically three-plus pounds. And what made this problematic is, if you added battery life you gained too much weight. For instance, the Microsoft Surface Book has light tablet mode, but only four hours of battery life in it, showcasing this ugly tradeoff. On spec, the Lenovo Miix 630 has up to 20 hours of battery life…or twice what Apple lists for the iPad Pro. This gives the Lenovo the multi-day battery life users have been asking for. On carry weight, without the keyboard, the Lenovo is 1.69 lbs., while the iPad Pro is 1.53 lbs. The Lenovo weighs more, but with an acceptable tradeoff of significantly better battery life. So we can argue that Lenovo and Apple have both fixed two of the major problems hurting this class. On screen, things get more interesting. The Apple has a 12.9” screen, with a 2224x1668 resolution and 600 nits of brightness. The Lenovo has a smaller 12.3” screen with 1920x128 resolution and 400 nits of brightness. So, the Apple has a much better screen but, once again, the trade-off is reduced battery life. 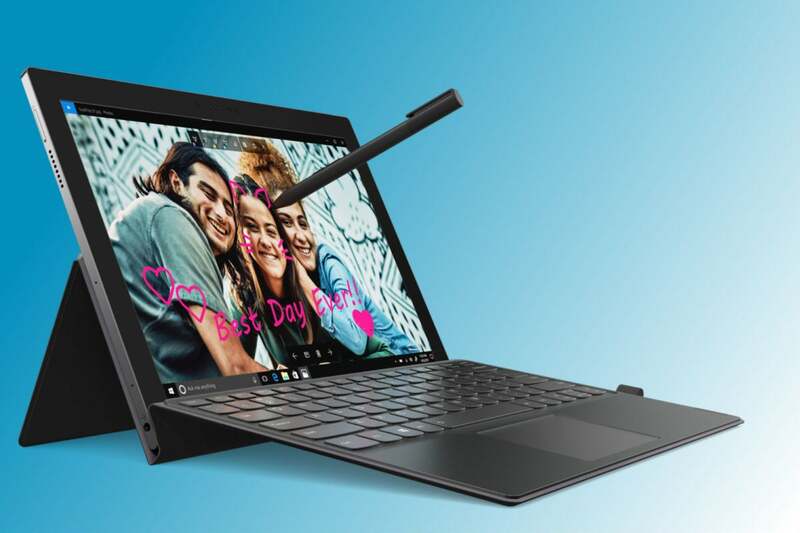 The issue remains with both products, though, that people appear to reject using a tablet larger than 10” (except for some vertical markets) and under 13” for laptops. The Lenovo is competitively priced at $899 including keyboard and active pen, the Apple is around $840 without keyboard or pen. Remember, the goal is a tablet you can also use for work. The problematic issue remains screen size. You get up above 10” and people just don’t seem to like the heft of these things as a tablet. And, if you drop down to around 10” or below, folks don’t like to work on the thing. This product doesn’t fix that. I still think a creative solution with a head-mounted display and AR with occlusion (where the created image looks solid) is where we’ll end up. This would allow the display to grow or shrink as needed. However, a foldable display – which is coming – would also address this same problem and truly give the product a far better dual-mode function…if weight can be kept down and battery life kept up. Of course, people could always change their behavior. Before the iPhone, big phones – particularly screen phones – didn’t sell well. Now they are the standard. Before the iPad, you generally couldn’t give tablets away. However, these changes both happened while Steve Jobs was leading Apple and was willing to invest the millions needed to create demand for those then-new products. That’s not the case now and so we aren’t seeing the shift to these larger-form tablets as a result. In terms of the Always Connected PC with the iPad as the target for disruption, the Lenovo Miix 630 is the closest I’ve seen so far to the ideal. To close the gap, however, we either need another approach to the screen – one that allows it to shrink and expand as the devices function changes – or a change in user perception to one more accepting of the larger screen on a tablet. In short, while the Miix 630 is a decent blend of current technology, I doubt this product class will take off until manufacturers definitively address the screen size issue. Once they do, this class of product should go vertical! Until then, these devices are likely best for those that have a need for filling out digital forms or drawing, which is where they’ve nearly always shined. One thing we did lose when Steve Jobs passed was this idea of funding to success. Jobs would set success as the goal and spend what it took to achieve it. Since his passing, executives tend to set a budget as a goal rather than success. Whether we’re talking the Apple Watch, iPad Pro or this Connected PC effort, we aren’t getting to a critical mass of sales as a result.